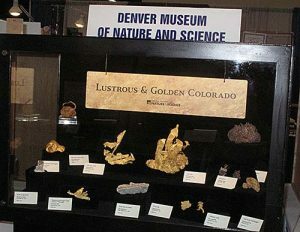 Farncomb gold display from the Denver Museum, on view at the Denver Show. It seems like every time I go to Denver for the shows in September, something new is happening. 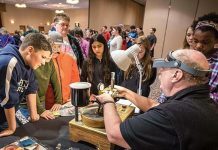 What started out as a small group of mineral clubs banding together to do a show 50 years ago has morphed into a major operation, surrounded by a handful of satellite shows. Now, the original Denver Gem and Mineral Show, sponsored by the Greater Denver Area Gem and Mineral Council, has become the centerpiece of a mini-Tucson event, with shows all over the map. The Denver Show—its most familiar name—is still held in the Merchandise Mart, which is a superb show site for several reasons. Located just off Interstate 25, north of downtown Denver, it’s easy to find. Parking is free, saving visitors cash for purchases. The parking lot, as big as it is, fills up quickly on opening day because this is still—and probably always will be—the number one show in Denver. 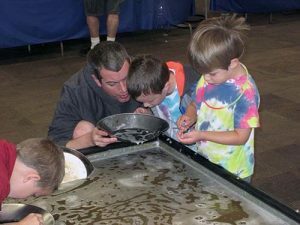 Panning for gold is one of the hands-on activities at the Denver Show. What I like about this show is that all the dealers are housed in two large, adjoining rooms and in several hallways, which are lined with glass-fronted dealer rooms full of beautiful goods. 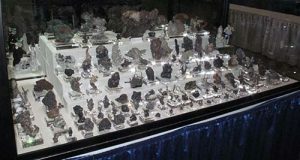 There are more than 124 dealers, who feature minerals ranging from the very best to excellent specimens for beginners. Initially, the Denver show was the only game in town, but just as in Tucson, those who could not get into the main show set up at satellite shows in nearby motels, some equipped with tents in their parking lots. This caught on rather quickly, and over the past 50 years, satellite shows have popped up like so many dandelions. Each has its own agenda and gives collectors more options. 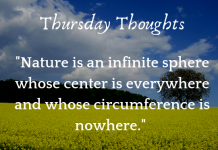 If there is one complaint I hear from visitors, it is that the distances they have to travel to go from show to show are quite long, and traffic at some times of the day is nearly in gridlock. The distance between the show farthest east of the Main Show and the show farthest west is something like 20 miles. Another complaint has nothing to do with the shows. It’s the airport. It seems like state authorities built this airport closer to Nebraska/Kansas than Denver! Once, I made the mistake of not renting a car and took a taxi into town from the airport. The taxi fare was nearly $100. Luckily, there is a light rail train that will take you from the airport to Union Station, in downtown Denver. This at least gets you within striking distance of the show area. Complaints aside, the Denver Show is really very well organized, and certainly gives visitors all they could ask for. The variety of dealers is excellent, and their offerings range from lapidary to minerals to books and magazines. The show features a wonderful selection of special exhibits, including ones from a dozen or more museums around the world, from the University of Wollongong (Australia) to our own Smithsonian Institution. In 2017, there were fine exhibits from 20 different museums and schools. They included beautiful, classic minerals and educational displays that caused you to stop, study and learn! The museum and school exhibits were rivaled by displays put in by clubs, individuals, and small groups of collectors who banded together to wow the visitors. These days, when the world’s finest minerals sell for huge amounts, the museums are hard pressed to get the best-of-the-best specimens. It is more common to see those in displays by private investors. silver from around the world. If you want to see the finest minerals extant today, the Denver Show is one place to do so, but don’t get the idea the exhibits are all flash and glitz. Another whole section of the display area is devoted to the exhibits of self-collected minerals put in by average rockhounds. It is not so spectacular, but certainly more typical of rockhound displays. Over the years, these people have found nice specimens of which they are proud, and deservedly so. The Denver Mineral Council, consisting of eight area clubs, has always favored the rockhounds and local collectors who bring the best they have found to put on display. This is really the heart of our hobby, and the council does a wonderful job of encouraging the average rockhound—man, woman and child—to display that which they have rescued from the earth! It is this part of the display area that I most admire and enjoy. I thank the Greater Denver Council for continuing the effort to put rockhounding first in organizing a very fine show. Of course, mineral exhibits trigger trophy awards. The Denver Show trophy I think the most of is the Junior Prospector award, which recognizes the efforts of youngsters out in the field. The top award, the Pearl Trophy, is named for Dr. Richard Pearl, who taught in Colorado for decades and was a talented writer of mineral books for rockhounds. Of course, the Denver Show is much more than dealers and exhibits. It is an excellent venue for experts in the field, who come from all over the country to give talks on their chosen subjects. It also gives members of organizations a chance to come together and meet. Our hobby benefits from the work of these groups, so giving them an annual venue is very important. There are also special areas set aside for special interest exhibits. I always visit the Fluorescent Room, which features minerals that respond to ultraviolet excitation. 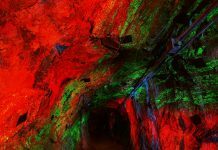 A room devoid of ambient light is needed for you to fully appreciate the unusual feature some minerals have of reflecting neon colors under UV light. Every kid who walks into the Fluorescent Room comes away awestruck by what seems to be a magical change in ordinary, drab rocks. 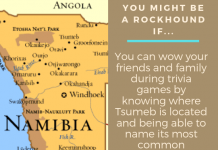 I can’t think of a better way to interest kids in the wonder and science of minerals. It sure worked on me, and still does! The Denver Council does a fine job of inviting a broad range of knowledgeable speakers. My friend Jeff Scovil, who is certainly one of the most accomplished mineral and gem photographers, gave a talk highlighting some of the world’s most spectacular specimens of gold and silver, in keeping with the 20017 show theme. This set the tone for Dr. Terry Wallace’s talk on Colorado silver. Another fine speaker was Virgil Lueth, who co-authored an article on garnets with me years ago. Virg is with the New Mexico School of Mines, and gave a great talk on New Mexico gold! These talks were followed by talks about sunken treasure, recent sources of gold in mining, and the mineralogy of gold and its rare compounds. All in all, there were nearly 20 lectures throughout the three days of the show. I only wish I could have caught them all! University of Wollongong brought a wonderful exhibit of models of the huge gold nuggets found in Australia, including the huge Welcome Stranger nugget, which was exposed by a wagon wheel, and the 1980 “Hand of Faith” nugget, which weighs 845 ounces! My favorite museum gold exhibit came from the city’s own Denver Museum of Nature and Science. It displayed pieces of Farncomb Hill, Colorado, gold—some of the most aesthetic specimens of the yellow metal ever found. I got a personal kick out of seeing these pieces on display because, years ago, then-curator Jack Murphy gave me the opportunity to photograph many of them. My son Evan was about 10 at the time. Jack handed Evan a small cloth bag and told him to take out what was inside. The surprise on Evan’s face was fun to see when he pulled out a 1-pound gold nugget. That same 1-pound nugget was in the show display. One of these days, I’ll do an article on Colorado’s Farncomb gold, along with Tom’s Baby, an amazing, 13-pound gold piece the owner carried wrapped in a blanket like a baby. The silver displays in 2017 were nothing short of breathtaking. Wire and crystallized silver specimens from Norway, Germany, Michigan, Idaho, and elsewhere in the United States filled two huge display cases, and were marveled at by show visitors. Again, I have a personal attachment to one of the specimens on display. Along the back shelf in one case stood what many consider the most exceptional silver specimen in the display. With a small base of crystallized silver, this specimen is a 7-inch-long curling ram’s horn (hook-shaped), striated wire of the native metal. It also has a smaller silver wire jutting off to one side. Why do I have an attachment to that specimen? Over 50 years ago, I bought it from a guy who rescued it from being taken to the mine dump. He sold it to me because it had no color! It sat in my collection, and then Evan’s collection for decades, until Evan decided to focus on collecting nothing but Arizona minerals. While I enjoyed the gold and silver specimens, my attention was drawn to a display by my good friends from Texas, Jim and Gail Spann. They had entered dozens of silver species: stephanite, dyscrasite, and many others. This display called for careful study, as almost every form of common to rare silver compound was sitting there. This array of silver species really rounded out the whole show theme of gold and silver. While the Tucson Show is considered the largest and finest mineral event in the world, don’t discount Denver. 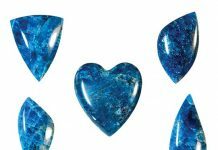 Thanks to the Greater Denver Area Gem and Mineral Council and its anchor show in the Merchandise Mart, attendance at the mid-September Denver Show is now required for rockhounds from all over the world. 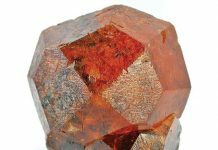 Whatever your interest in minerals and gems, the Denver Show or one of its satellite shows will have it! See you there in 2018. Holds the Carnegie Mineralogical Award, is a member of the Rockhound Hall of Fame, and has been writing for Rock & Gem since its inception. He lectures about minerals, and has written several books and video scripts.